Another month has come & gone and so we have a number of toy galleries and in depth reviews by our Photo & Content staff to round-up once again! Though all the products we reviewed this past month were released in the last 3 or 4 years, the content they covered spanned decades. A selection of Ranger Keys took us down the path of Metal Heroes from 1982 all the way to 2012, the Legacy line gave us a one-two punch throwback to 1994 & 1995, and we caught up with some much needed gallery 2.0’s a recent and often overlooked sentai. The Bandai Tamashii Nations event may have only just started but the new reveals are coming in thick and fast! Many hobby magazines and stores are in attendance, and thanks to the likes of Amiami and Dengeki Hobby here are the figures you can look forward to coming in the near future! Get ready for a pretty long list. S.H. Figuarts Rideron & remaining Showa era bikes! The whole S.H. Figuarts Goranger team! The whole S.H. Figuarts Sun Vulcan team! The return of Garo S.H. 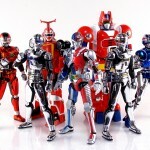 Figuarts! Which figures will be on your to buy list in 2015 and beyond? Be sure to check the huge amount of images we’ve gathered and discuss after the jump!